Apple cut the price its products in India this week, discounting its iPhones by up to 7.5 percent alongside reduced-cost iPads and Mac systems, with the pricing adjustment coinciding with the introduction of major sales-related tax reforms in the country. The prices of iPhones dropped across the board in India by at least 4 percent on July 1, with the cheapest iPhone SE cut from Rs 27,200 ($420) to Rs 26,000 ($402), reports the Chandigarh Metro. The iPhone 7 range starts from Rs 56,200 ($867), down from Rs 60,000 ($926), and the highest cost iPhone, a 256GB iPhone 7 Plus, has been cut by Rs 6,000 to Rs 85,400 ($1,319). The 32GB 9.7-inch iPad is now priced at Rs 28,000 ($432) instead of Rs 28,900 ($446), with the 128GB model falling from Rs 36,900 ($570) to Rs 35,700 ($551). Similar discounts have also been applied to the iPad Pro range, with the 64GB 10.5-inch model starting from Rs 50,800 ($784) and moving up to Rs 73,900 ($1,140) for the 512GB variant. The 2.3GHz non-Retina 21.5-inch iMac has only received a small change in price, moving from the previous Rs 90,900 ($1,403) price to Rs 90,200 ($1,392). The Apple Watch has also seen changes in price, with the Series 1 starting from Rs 22,900 ($353) instead of Rs 23,900 ($369), and the Apple Watch Series 2 selling for Rs 31,600 ($488), down from Rs 32,900 ($507). The price changes in India arrive at the same time as the country implements a new sales tax system. The Goods and Services Tax (GST) replaces multiple taxes levied by various central and state governments with one single tax, with five different tax rates ranging between 0 percent and 28 percent, applicable depending on the product or service being taxed. In the case of smartphones, such as iPhones, the GST rate is 12 percent, down from the previous 13.5 percent in taxes that would have been levied. In theory, this would bring the cost of the iPhone down on its own, but not by the amount Apple reduced its prices by. An Apple official advised to the Chandigarh Metro the price reductions have nothing to do with GST's introduction, and is only being performed to improve the company's position in the Indian market. Apple has steadily pushed to increase its market share in India over the last few years, and has recently started to manufacture the iPhone SE in the country for sale locally. 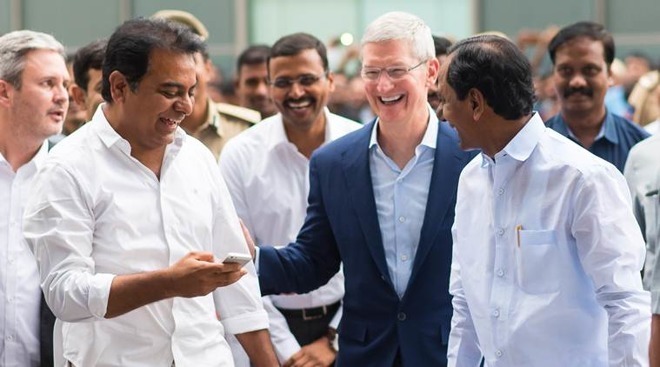 The manufacturing effort is Apple's attempt to meet local sourcing requirements for launching its own retail stores in India, rather than continuing to rely on a network of authorized resellers. In a bid to increase its sales in June, Apple allowed authorized vendors to cut the price of older iPhones, as early as the iPhone 5 and as recently as the iPhone 7. Apple currently only has a 3-percent market share in the country, with Apple's price cuts bringing its premium smartphones closer to the cost of the cheaper Android devices currently dominating the local market.